4/1/2019: We are taking no more orders on Ashitaba plants until we can replenish our stock. We look forward to listing this again in June of 2019. Please check back at that time! Hardy to Zone 7 to 12. (HACHIJO-SOU, Tomorrow’s Leaf) Biennial native to Hachijojima Island in Japan. 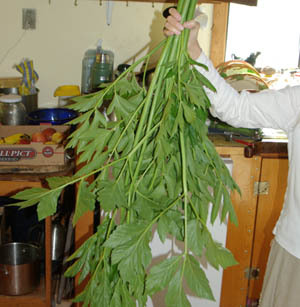 This is the standard type with green leaves and stems. High chlorophyll plant with yellow sap, unique among Angelicas due to its edibility and the presence of both B 12 and the flavonoids known as “chalcones.” Mature size is about 4 feet wide and flowering to about 5 feet tall. 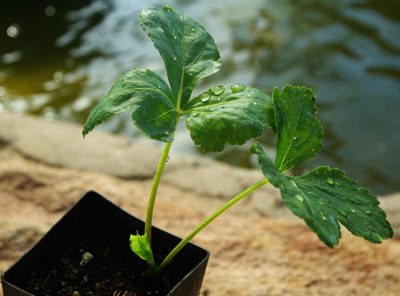 The plant requires warm temperatures for optimal growth–75 to 85 degrees F. They need at least 6 hours sunlight daily to thrive! It is often best to greenhouse them, although coastal climates (such as San Francisco area) seem to work pretty well for outdoor cultivation, and zone 8 growers may find that these plants do fine in regular open garden conditions. 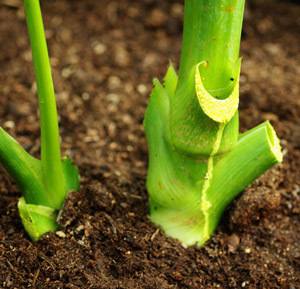 For best results, plant into a large container of compost. Space plants 3 feet apart. “Plants ordered today will ship within 3 weeks.” How do I order today? I only get the wish list option. Thank you for staying in touch and sorry you haven’t received your plant yet. 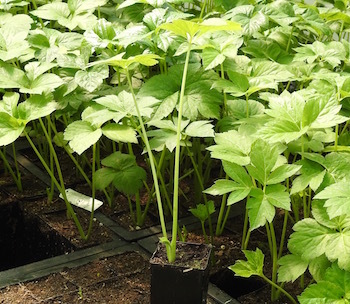 We shipped the last of our first planting of Ashitaba on April 1 so if you haven’t received a plant yet, our plan is to send you an ashitaba from the second planting, which will be ready to ship around May 6. Sorry for the wait! I ordered mine 3/24 and didn’t receive yet. It would be nice to get some communication on expected shipment date, and an update if that changes. Thanks for staying in touch. 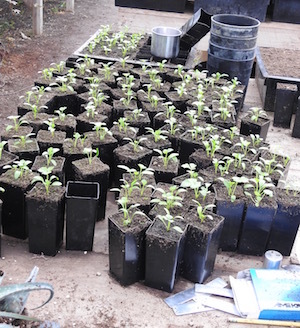 We shipped out our first planting of Ashitaba and expect to ship the second planting omMay 6/7. Thank you for your patience, and yes, everyone was e-mailed about this. My plants arrived 2 days after shipping. They were very healthy. It’s been 2 days since they’ve arrived, been repotted, and have perked up nicely. I’m very pleased with my order and look forward to ordering more soon! I received the plant yesterday and they seems to be in good shape. How far apart I should plant them? I would like to have half a cup or so of fresh leaves a day. Are 6 plants likely to be enough? 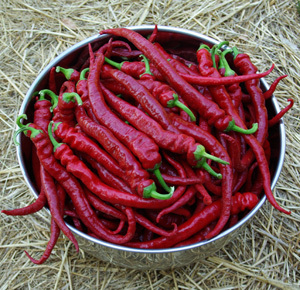 How should I harvest in a way that gives me a good supply without hurting plant health? Yes, both the leaves and the stems are very good. 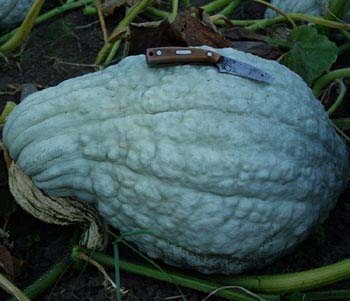 You wouldn’t be able to harvest right away, but after growing the plants on for some time the plants will size up, and 6 plants would probably suffice, for awhile at least. Yes, although it would grow faster in a greenhouse. Just read a very good report on the benefits of the plant. Excited to try but wondering, how do you prepare for consumption. Do you make a tea? How much is enough per day? Have you consumed it on a daily basis? Excited to hear your responses, thanks in advance! Despite the convincing historical support for consuming the plant in the fresh or vegetable state, a culture of Ashitaba tea enthusiasts has sprouted up. Hot water is mixed with 2 tablespoonsful of the green-gold powder of dried leaf and stem, stirred and drunk thick. 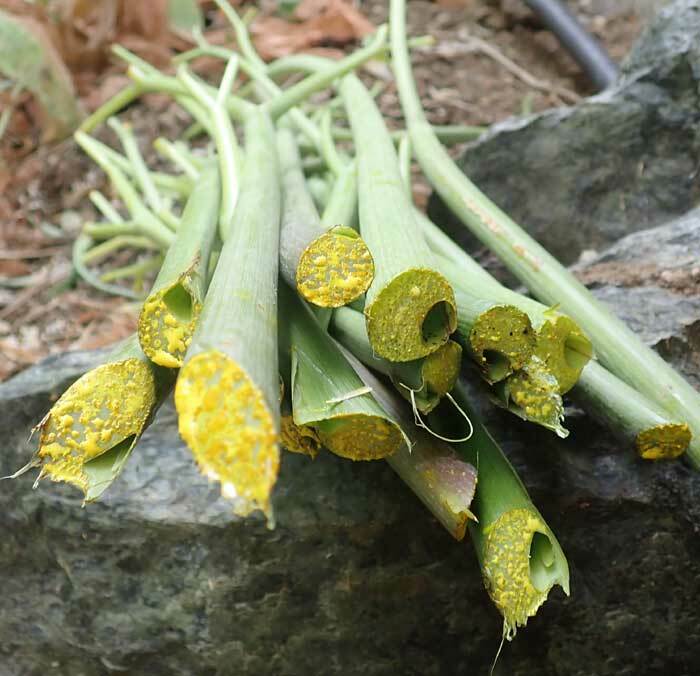 To make the powder, slice the stems and leaves thinly and dry on paper in a warm, well-ventilated area. Turn the pieces to afford even dehydration. When crispy dry, grind thoroughly, then sift out the larger bits, storing the fine, green-gold powder in a light-proof glass receptacle with a tight-fitting lid. Hi I live in s/W Florida. My plants did really well through the summer but in the fall they were decimated by caterpillars. They literally ate every thing flowers, leaves and even the seed pods. I was wondering what I could do? I’m in Zone 10a (inland Orange County, California) Do I have any chance of growing these outdoors? Will the summer be too hash for these plants? They will take quite a bit of heat, but prefer maritime conditions to desert. Provide shade and spray them down occasionally. 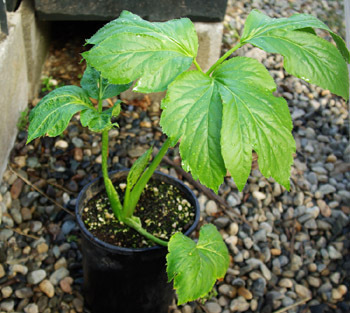 Ashitaba is adaptable to Orange Co.
Are there any effective consumable products that you trust that can be purchased if growing a plant is not practicable? Teas, cooking herbs, etc.? Hi, just wondering how far you will ship your plants? I live in Alabama. Thanks! Anywhere in the USA, including (sweet home) Alabama. 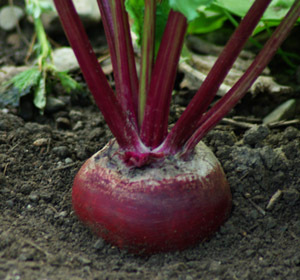 Do you have any seeds?I am in Switzerland and want to trial at 1500 meters in the Alps. I bought 2 plants from you . One of them lasted 2 years and the other 3 years. I thought these plants were perennials. Am I wrong? Ashitaba is biennial and monocarpic. 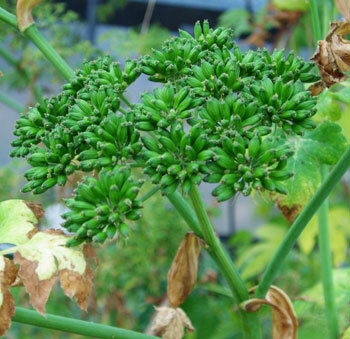 The plant normally goes to flower in the fall of the second year of growth and dies back after that. 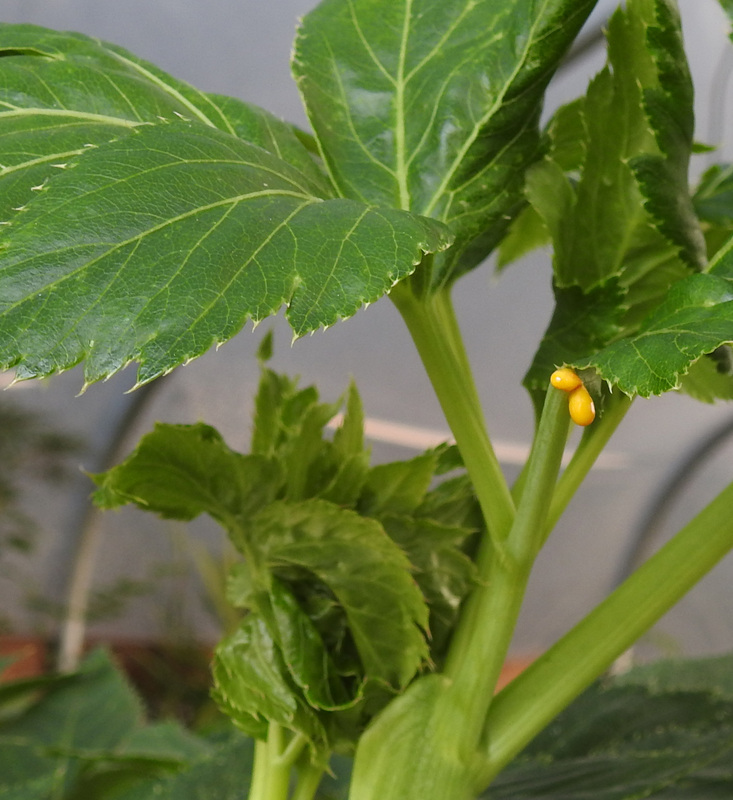 If you cut back the flowering stalk and prohibit the formation of flowers, or if for some reason it fails to go up to flower in the second year, then it may live for longer than 2 years. 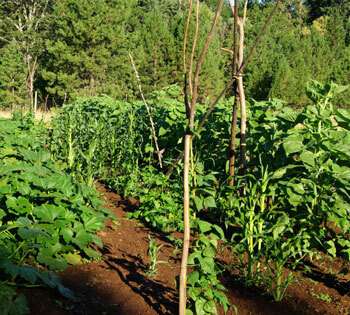 The leaves are harvested any time they are big enough to eat, and the root may be dug and utilized right after the maturation of the seeds. Will this grow well in the Pacific north west region? Great plant! Caterpillars think so too!! I love this plant. It grows well for me in Texas. Just discovered that it is a host plant for black swallowtail butterflies. The caterpillars love it too! Can it be pruned to have more branches, like a papaya tree? The quality of Strictly Medicinal’s shipped plants were above expectation, they come with a shipping tracking number to watch carefully so they can be rescued in their time of disruption as soon as possible, they arrived in 48 hours of shipment. Upon reading careful instructions and pulling each plant out, surprisingly they came out nearly glowing, with a few crinkles and bends on only their leaves, they sat upright immediately welcoming their new home. The careful packaging was not limited to keeping them safe from battening, but with wishes of luck, love and health. Kind regards and much gratitude! 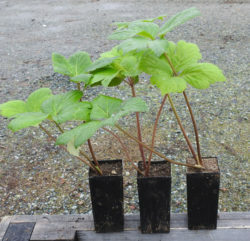 I would like to buy 3 or 6 of your ashitaba/angelina keister plants. I just ordered a Ashitaba plant..All orders ship in Sept?So this just reserved my order? We don’t ship plants in August, it is too hot. Plants ordered and paid for in August are shipped first-com, first-served starting in September. I ordered six Ashitaba plants and received healthy/vital starts—beautifully packed for shipping. I had questions about best growing conditions and both the phone support and email response were forthright and generous. I’m excited to see how they make themselves at home in my garden. Thank you! This plant is said to help a lot of illnesses. I would like to try it!